InAEA | Fountainhead, XXV Black International Cinema Berlin 2010, THE COLLEGIUM T.V. Fountainhead, XXV Black International Cinema Berlin 2010, THE COLLEGIUM T.V. "A COMPLEXION CHANGE – International & Intercultural Diplomacy"
"The future will not be mastered by those who dwell on the past." 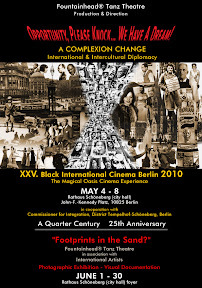 From May 7-10, 2009 Fountainhead® Tanz Theatre under the direction of Prof. Donald Muldrow Griffith and Prof. Gayle McKinney Griffith, present the interdisciplinary and intercultural film/video festival Black International Cinema Berlin for the 24th year. For the first time, the festival will guest at the Rathaus Schöneberg (city hall) and be presented in cooperation with the Commissioner for Integration of the district Tempelhof-Schöneberg, Berlin, Gabriele Gün Tank. Under the theme "A COMPLEXION CHANGE - International & Intercultural Diplomacy”, films from Africa, the African Diaspora and films with an intercultural perspective are the focus. Approximately 60 productions will be screened, among them cinematic works from Cape Verde, Benin, France, USA, Iran, India, Togo, Senegal, Belgium, Germany, United Kingdom, Colombia, Spain, Nicaragua, Switzerland and Madagascar. In addition, film discussions, performances and seminars will be conducted. Our festival is supported as an ideal project by the German Commission for UNESCO, Bonn. As a result we received the following letter of acknowledgement from Christine M. Merkel, Head of the Division for Culture and Memory of the World. "A COMPLEXION CHANGE 2009-2011 is an International Media Project with a very contemporary and innovative approach. It aims at contributing to the strengthening of international understanding, peace and friendship among peoples. It promotes intercultural dialogue in the spirit of the ideals and aims of UNESCO. The German Commission for UNESCO appreciates this initiative. We kindly ask you to assist Prof. Donald Muldrow Griffith and the Fountainhead® Tanz Theatre / Black International Cinema Berlin / The Collegium – Forum & Television Program Berlin & Cultural Zephyr e.V. as well as all other co-organizers and project participants in realizing this project. We are convinced that this idea can offer inspiring experience to many people in the region." "Since it was founded in 1986, the Black International Cinema festival in Berlin has developed into one of the most highly regarded film events in Europe and movie fans will have the chance to experience it for themselves between May 7th and 10th. Produced and directed by the Fountainhead® Tanz Theatre, the extravaganza is an interdisciplinary and intercultural celebration of the contribution made by black actors and directors in the world of film. The focus of the festival is to present works of a cultural, artistic and political nature coinciding with the general social, economic and educational interests of people from Africa. Open to all filmmakers and visitors, the event provides a platform for the impact of cinema from the African Diaspora and people with an interest in intercultural relations. The Fountainhead® organization is committed to fighting religious, ethnic and gender persecution and seeks to battle discrimination through dialogue and understanding. By using art, theatre, dance, music and seminars, the foundation believes that prejudice against disadvantaged groups can be challenged and stronger links within society can be forged. Visitors will be treated to powerful and thought-provoking examples of cinema from the past and present." Tel. : 030-782 16 21/75 46 09 46 oder Fax: 786 34 66. 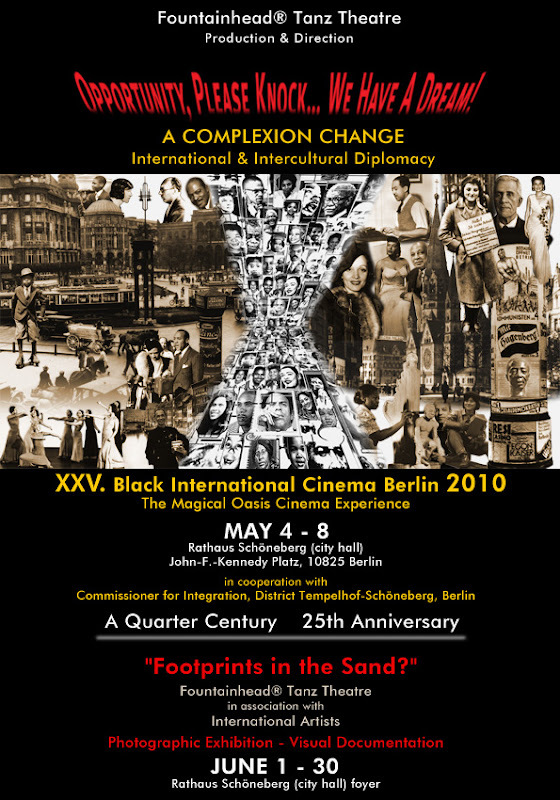 AN ANNUAL INTERNATIONAL; INTERCULTURAL DIPLOMACY FILM FESTIVAL, Founded Berlin Germany 1986.